There is a secret in this old house. An old secret carried on whispers through years and years past. The voices call out silently, spirits float like dust motes on an unseen current of cool air. The truth, just out of reach, balances on the edge of our reality. Gabrielle called in tears. During a dinner party, something had pushed her, tearing the shoes off her feet and sending her sprawling onto the dining room table. Stemware was snapped in half, glasses were thrown about and found shattered on the floor.“It happened again the other day!” she said. Something had attacked her again, this time giving her a black eye in the process. 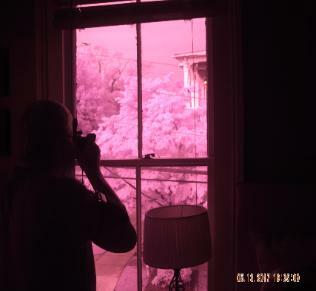 Port City Paranormal has investigated many of the historical homes in the area. Many of those are peaceful hauntings, but the activity in this home seems to have a malevolent intent and may be getting stronger. What are the spirits trying to tell us? What is powering the spirits who have previously been silent? This lovely old home is over 157 years old, a gem tucked away on a quiet side street near the river.We swung the old wrought iron gate open and walked up the path as the evening mist settled on the thick azaleas surrounding the house. We climbing up to the porch, soft muffled sounds of music and laughter came through the screen door. We rang the bell…. The client’s husband appeared seemingly confused as to who we were. After some introductions, he ushered us into a small dining room, told us to wait for Gabrielle and left. We blinked in disbelief, when we realized we were standing at the scene of the first attack. Doug quickly set up a stationary camera in the far corner. Jeff and Deb drifted around the main foyer taking photos, performing electronic sweeps and getting the feel of the place. Seconds later Jeff returned to the dining area pale and short of breath. “Set up your video cam at the base of the stairs” he said, “I saw a woman in period clothing standing up there.” Deb came back and reported her compass was spinning wildly and she too had seen a female shadow at the top of the stairs. Shortly afterwards, Gabrielle joined us in the dining room. She said her son could stay for only a few minutes, and as he had witnessed activity, we all went upstairs to his room for our first EVP session. Gabrielle and her son sat on the edge of the bed, our investigators moved to the far corners of the room to observe. We usually ask questions in a quiet conversational tone, but the homeowner addressed the spirits in a loud demanding manor. She called it her “Teachers Voice.” We used that opportunity to teach to the owner and son that a kinder approach usually produces better communication and less negativity (As was later borne out by EVP-J03.) All investigators felt the room was electrically charged, producing a slightly disorienting feeling ,or to others a momentary dizzy sensation. Although the room was 72 degrees, the male investigators felt the room was extremely hot, but frequent small cold spots moved randomly around the females in the room. Gabrielle stated her left arm was very cold. Doug used his infrared thermometer to confirm her left arm was 74 degrees while her right arm was 87. The phenomena only lasted a moment and the temperature rose slowly to equal 87 on both sides. Gabrielle pointed to a window on the eastern side of the room. The glass is original to the home and on it; the owner had etched his name. 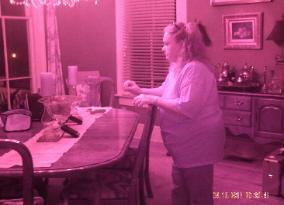 Several investigators placed their hands on the glass to gather information by means of psychometry. Doug felt an electrical shock flow down his arm, while other members sensed a pervading sadness and a touch of fear. We believe that both a male and a female spirit are connected to this house. Deb’s compass spun several times during our time in son’s room, eventually coming to rest pointing South East instead of North. The remainder of the upstairs was unremarkable except for a general uneasy feeling at the head of the staircase. Jeff felt as if he had walked through cobwebs as we moved in a group back down stairs. After we left the top floor, the son left the house and Steve retired upstairs to the south facing study. I joined Gabrielle in the main parlor and music room to continue my interview, while Deb, Jeff, and Doug investigated on their own.The team reentered the dining room for another EVP session. This room, which had been benign before, had now become oppressive. Doug felt he had to leave the room and immediately felt better when he did so. After a few calming breaths he returned to the dining room to continue with the session with no ill effects. Towards the end of the evening, we all joined Gabrielle in the kitchen. Her kitchen is quite large with a central prep area, snack area, and a small breakfast nook behind the main kitchen that used to be a back porch. few feet behind, saw the same liquid form squeeze between Deb and the counter only to dissipate on the other side. In the small nook in the back, Deb and Doug saw a dark shape sitting facing the outer wall. The apparition faded in just seconds. Other investigators reported smaller dark shapes darting around the back of the kitchen. witnessed this from a different angle as he braced the bar with his arms trying to avoid crashing face first into the counter. Once Doug regained control, he hopped off the barstool and stood there wide-eyed. He blurted, “Something pulled the seat out from under me!” The shadow entity was seen by several investigators numerous times during the investigation. The cause or identity of this entity remains unknown, We hope a follow up visit will reveal more clues. child spirit. Here the recorded Electronic Voice Phenomena (EVP) supports the psychically obtained information. There have been several deaths in the house two of which may have been due to Yellow Fever that swept through Wilmington in late 1860s. Other recorded deaths were probably due to causes that are more natural. (Death does not automatically guarantee a haunting. )EVP evidence can indicate a Residual Haunting (plays like a video tape regardless of activity), or an Active Haunting. 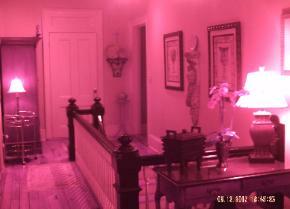 In this house, many of the EVP are in direct response to our line of questioning, therefore considered Active. are seeing any more than we do when seeing an apparition. What they see may confuse, frustrate, or anger them. It may also be very frightening! What we witness on this end is their attempts to contact us. Sometimes entities can be tricksters or just be nasty: Remember, you are in death what you were in life. The body may die, but the personality lives on. cause an increase in activity such as with poltergeist cases. The best approach to any haunting is to remain calm. For some hauntings, it is best to ignore the activity and not interact with it. We think the best possible solution is to try to live in harmony with the dead. We do not advocate removing or banning a spirit from a home. We also do not think we have the right or the power to tell a spirit to “move on” or “go to the light.” The living cannot tell the dead where to go or what to do, especially when we have no idea of what is on the other side. Be sure to speak gently but firmly to any stranger in your home. Explain what your rules are, such as “no physical contact” or “please don’t break my things.” The Reveal: We explained to the family that the folks who haunt the home may be lost, or waiting for a loved one. If you like, you can welcome them to share your home but always be polite and firm. They were there first, but you are here now. The family has agreed to share their home with the previous human residents, they will be welcome and part of the family, but they want a cleansing to remove the shadow like entity. We hope the cleansing will clear the negative aspect of the haunting and all can live in peace no matter what their plain of existence. J#2 “Huh?” Higher pitch, could be a child?